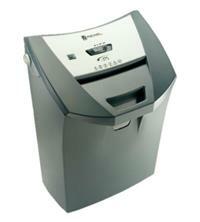 The Rexel Easyfeed CC175 Cross-Cut Shredder has a unique angled head to make it easier to feed in paper when the shredder is stored under a desk. Ideally suited to small or home offices with restricted space, this machine will shred up to 8 sheets of paper at a time. With the Rexel CC175, each sheet of A4 paper is shredded into approximately 200 4mm x 45mm cross-cut pieces, giving it a P-3 security rating. This makes it suitable for the shredding of confidential documents. The waste bin has a 22 litre capacity and also features a see through window so you can see when it needs emptying. Plus, in addition to paper, the shredder will also shred staples, paperclips and credit cards, very handy if your documents are fastened together and if you need to shred old bank cards, for example. The 220mm throat entry width handles all your A4 paper shredding and the shredder can be used continuously for up to 3 minutes before a 30 minute cool down period is required. For safety, the shredder also has a thermal cut-off feature. Other helpful features include: a safety lock to disable the shredder when required; a reverse option for handling any paper jams; a lift handle which provides convenient access to empty the basket; low noise level; and self-adhesive hooks to hold a shredder bag in place, should you wish to use one. Warranty on the Rexel Easyfeed CC175 Cross-Cut Shredder is 2 years for the machine and 5 years for the cutting blades.